As winter makes its annual retreat and life slowly returns, our outdoor spaces beckon to us. After the compulsory yard work and clean up is accomplished, and the patio furniture and grill are in place, take your outdoor space's decor scheme to the next level with outdoor artwork and custom printed throw pillows. Though usually we print custom wallpaper and giclee for interiors, a number of our products can be used outside. Our outdoor artwork is printed on a self-adhesive vinyl, laminated, and mounted to impact resistant plastic sheets. This process creates a print that can last for at least five years outdoors. The perfect way to utilize your last tropical vacation's digital photos if you'd like to use our displayed image as inspiration. Our outdoor artwork is completely customizable and may be shipped at sizes up to four feet by five feet. With the outdoor artwork up, continue the look with custom printed throw pillows. Full color digitally printed pillows can have any image you want on them. In our outdoor scene shown, we've enhanced the tropical feel of the outdoor artwork with pillows with a palm image printed on them. The personal aspect of using your own photography to create this look makes these pillows quite special. Not only will they enhance the look of your deck or patio, but you'll also be fondly reminded of past trips. A great way to make these memories and photos a more salient aspect of your life, as opposed to the images languishing in a flash card. 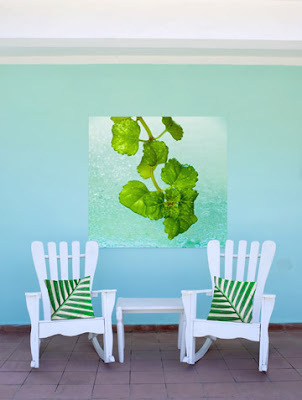 Now that we've dug ourselves out of the snow, dig up your favorite digital imagery and breathe some fresh life into your outdoor space. Contact us to begin your project today! Love your simplicity and use of color .